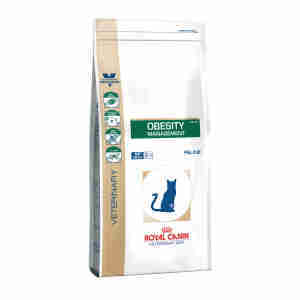 Help your cat lose weight and achieve a healthy size with Royal Canin Veterinary Diet Feline Obesity DP 42. Royal Canin Veterinary Diet Feline Obesity DP 42 is specially formulated to help shift your cat's excess pounds and have it looking sleek again. This is a dietetic feed that's specifically designed to help combat obesity in adult cats, and it works by combining high amounts of proteins contained in poultry, cereals and eggs, with all the vital nutrients and minerals your cat needs to maintain its health. It's also low in starch and packed with vitamins so your cat won't lose out on anything it needs. Essential fatty acids have also been added to the feed, which help keep your cat's skin healthy and maintain a rich, shiny coat. great taste that cats love. Many cats suffer from obesity. In fact it's estimated that it affects up to 30% of cats in the UK alone. If your cat has noticeably grown in size, seems sluggish or has trouble moving, it may be overweight. This can not only greatly reduce its quality of life but also give rise to conditions such as diabetes and stressed joints caused by carrying too much weight. By acting early and contacting your vet at the first sign of symptoms, you can stop these potentially painful conditions from developing. Your vet may advise you to put your cat on a specialist diet. In this case, Royal Canin Veterinary Diet Feline Obesity DP 42, which is approved by vets, could be the ideal choice to get your cat back to its ideal weight and have it feeling and looking healthy again. Because veterinary diets are formulated for the nutritional support of pets with specific clinical conditions, we recommend that you only use them under professional advice. For more information on feeding Royal Canin Veterinary Diet Feline Obesity DP 42 to your cat, please consult your veterinary surgeon. Dry food composition: dehydrated poultry protein, wheat,wheat gluten*, vegetable fibres, maize gluten, hydrolysed animal proteins,animal fats, beet pulp, minerals, fish oil, psyllium husks and seeds,hydrolysed crustaceans (source of glucosamine), marigold extract (source oflutein), hydrolysed cartilage (source of chondroitin). ADDITIVES (per kg):Nutritional additives: Vitamin A: 25000 IU, Vitamin D3: 1000 IU, E1 (Iron): 39mg, E2 (Iodine): 3.9 E4 (Copper): 3 mg, E5 (Manganese): 51 mg, E6 (Zinc): 152mg, E8 (Selenium): 0.07 mg - Preservatives - Antioxidants. ANALYTICALCONSTITUENTS: Protein: 42% - Fat content: 10% - Crude ash: 8%fibres: 6.4% - Perkg: Metabolisable energy: 3559 kcal - Omega 6 fatty acids: 22.2 g - Omega 3fatty acids: 4.3 g.
Wet food composition: meat and animal derivatives, cereals,eggs and egg derivatives, derivatives of vegetable origin, minerals, molluscsand crustaceans, various sugars. ADDITIVES (per kg): Nutritional additives:Vitamin D3: 190 IU, E1 (Iron): 6.4 mg, E2 (Iodine): 0.2 mg, E4 (Copper): 1.7mg, E5 (Manganese): 2 mg, E6 (Zinc): 20 mg - Technological additives:Pentasodium triphosphate: 2 g, Calcium sulphate: 1.2 g.
ANALYTICALCONSTITUENTS: Protein: 7.5% - Fat content: 2% - Crude ash: 1.9% - Crude fibres:1.5% - Moisture: 84% - Metabolisable energy: 540 kcal/kg. This product keeps my cat Tia in great shape, thank you! It is reasonably priced and quickly delivered. Thanks again! I have ordered food from Medicanimal for at least 6 months now and never had a single problem. Great service and speedy delivery! Thanks. I am very pleased with both the product and with the excellent service I receive from Pet Supermarket. It keeps my cat Tia's weight down to an acceptable level, and always comes promptly. Excellent weight loss product. The cat has lost over a kilo to the vets delight. The cat is happier and so is the vet. Now to keep the weight off, so continuing to feed this kibble. I would very much recommend this to help with weight loss in cats as it has worked for my cat. Our 2 cats are large both are ex boys probably genetics I guess although just moggies, small one is 6.5k and larger one is 9.2k as at today but has been 10k before now. Both love this stuff and eat is as part of their main diet base. Only issue or comment I have is more with Royal Canine not having a reseal top on the 6 Kilo large bag but that's not a Medical Animal fault of course. Would recommend product to anyone with a fussy but overweight cat.